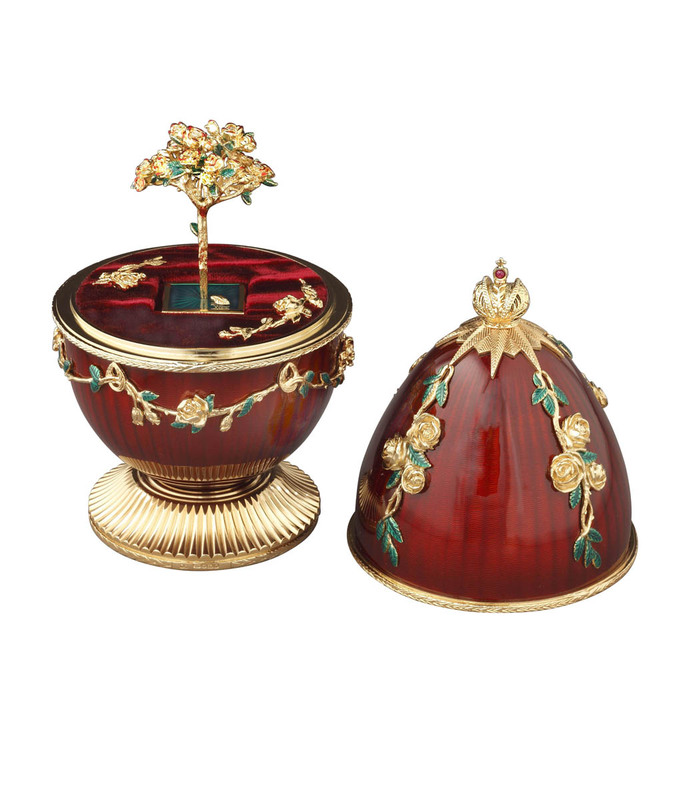 Theo Fabergé designed his RED ROSE EGG as a part of a small series of eggs featuring his favourite flowers. The design is inspired by his and by Carl Fabergé ’s love of flower surprises, thus following the family tradition but within his own style. 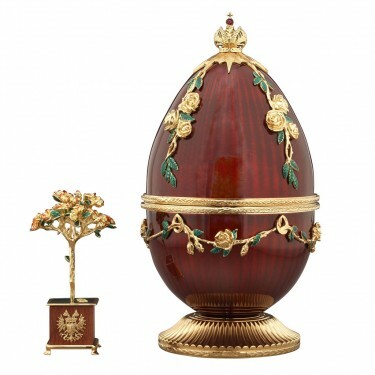 The Egg is created using materials and techniques made famous by the Fabergé family. The RED ROSE EGG is engine turned and then guilloché enamelled in rich red, one of the most difficult and individual enamel colours to achieve. The exterior surfaces are ornamented in gold, sterling silver and green enamel. The base is ornamentally turned on Theo Fabergé’s Holtzappfel lathe dating from 1861. The finial is the Imperial Crown of the Romanov dynasty, set with a cabochon ruby. 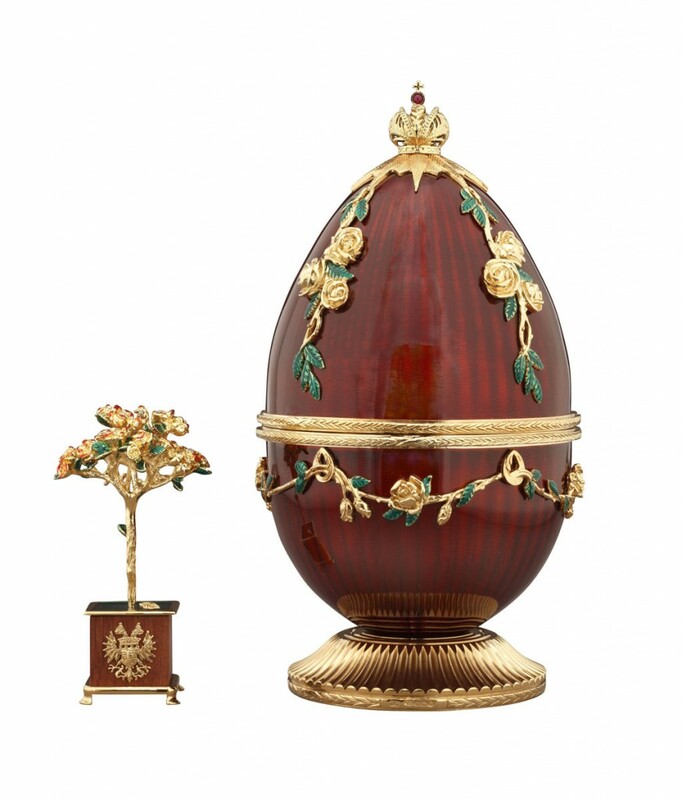 Open the Egg to reveal the surprise; a rose tree in full flower fashioned in gold, silver and red and green enamel. 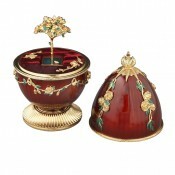 The rose tree flourishes in a planter of bubinga wood surrounded with gold and silver and green enamel. Within the rose flowers are 10 diamonds sparkling in the sunlight.